Science Objects are two hour on-line interactive inquiry-based content modules that help teachers better understand the science content they teach. This Science Object is the fourth of four Science Objects in the Energy SciPack. 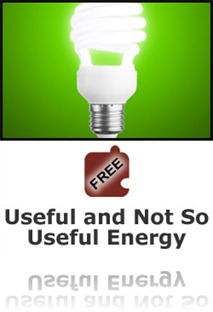 It provides a conceptual and real-world understanding of why energy in some forms can easily be used but in other forms is difficult to use. Energy transformations usually produce some heat, which is transferred to cooler places or objects in the surrounding area via radiation or conduction. In such interactions the number of atoms or molecules is very large and statistics dictate that they will end up with less order than that the initial state. Although just as much total energy remains, it is more widely distributed or spread out which means less can be done with it. This is because useful transfer of energy can be accomplished only when energy is concentrated (such as in falling water, in high-energy molecules in fuels and food, or in radiation from sources such as the intensely hot sun). This Sci Object was a great way to elicit some misconceptions on the subject of energy usage and address them via relevant data. It assessed for understanding throughout with little quiz questions. Regardless of whether you got the question right or wrong, it would include an explanation of why. It is very practical in terms of judging between different energy sources and determining the usefulness of them. Also, covers ideas such as efficiency, entropy, and perpetual motion machines. Overall, a good way to help solidify knowledge on the topic.